When you work in advertising and marketing, you end up spending quite a lot of time on social media. 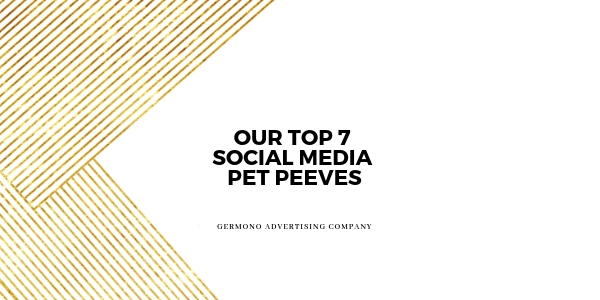 Over the years, our team has developed a few pet peeves when it comes to social media, and to stay in our good graces (and those of your followers too! ), we have decided to compile a list of our Top 7 Social Media Pet Peeves. 1) Spam on Instagram, including bogus comments and automated accounts.- This is probably one of everyone’s least favorite things. Seriously, who wants a comment on a photo of your dog that says “you look beautiful?” or a misplaced smiley face when you post something sad? Both Lindsey and Rachael listed this as their biggest pet peeve, but the rest of the team agrees. Pro tip: Skip the bots, and spend some time engaging with your audience. Pro tip: Use Facebook’s built in scheduler to schedule out your content for the week. Pro tip: Refer to Facebook’s page policies and note that it is against their guidelines to use personal pages for commercial purposes. 4) Sharing photos and other content without crediting the original owner. Not only is this illegal and you could get in some BIG trouble for it, it’s also just not a good look. If you love something that someone has posted, make sure that you give them credit for it and tag them, you’d want the same courtesy, right? Pro tip: Just take your own photos, don’t use those you find on the internet, or use images from sites like unsplash.com or pixabay.com where you can get free photos licensed for commercial use. 5) Unverified Business Pages on Facebook. Folks, this takes just a few seconds and if you aren’t able to verify via phone number, upload a business document. This helps your page populate in Facebook search, so consider it a form of SEO! Pro tip: Go to page –> settings –> Page verification on right hand side. 6) Website social media icons not opening to the correct business pages. Guys, if you have a social media icon on your business website and people click on it, they want to check out your business page. Make it easy for them by correctly linking your social icons on your website! 7) Facebook Live. During our team chat this week, we had a discussion about our love/hate relationship with Facebook Live. We love that it boosts our clients engagement on their Facebook page, but we have a few peeves as well. First of all, the notifications for every single person that goes live can get a little tedious, and secondly, waiting for 3 minutes for people to hop on is a little excessive and frustrating for those who are joining you live and can’t fast forward to the good stuff! Pro Tip: To turn off your Live (or any other annoying) notifications: From a desktop, log into Facebook, and go into your settings on your computer, click notifications, click edit, and choose which notifications you want to turn off. We are always looking for different ways to improve the way we manage our client’s social media accounts, so we’re curious, what are your social media pet peeves?